The Krueger Pioneer Home was organized in1889, its object being to provide a home for unfortunate and indigent men and was founded by one of Essex County's wealthy citizens, Judge Gottfried Krueger, whose honored name the institution bears. A home for German aged. Age of admission, 65 or over. Entrance fee, $1000. Note: No further inmates will now be taken. Home supported by Gottfried Krueger. 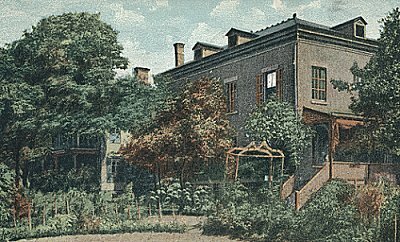 Situated in a beautiful and healthful region, shaded by splendid old trees and surrounded by a large garden and many fruitful acres, lies the "Gottfried Krueger Pioneer Home for the Aged," founded by Mr. Gottfried Krueger at a cost of about $30,000, at a meeting of the German Pioneer Society (founded in 1884). On October 28, 1889, the institution was incorporated and on May 30, 1890, the opening of the Home took place. Gov. Abbett and many State, county and municipal officials were present. The first board of directors consisted of Messrs. Gottfried Krueger, president; John Otto, vice-president; F. C. Adler, recording secretary; John Herpich, financial secretary; Julius Stapff, treasurer. At this opening of the Home for the Aged, Mrs. F. C. Adler, president of the Ladies' Auxiliary of the Pioneer Society (Pioneer Frauen Verein) agitated the question of the founding of a Home for the Aged Women, a proposal which found such great approval that on that same day $2,400 was subscribed. The cause was energetically furthered and, thanks to the liberal contribution of Mrs. Trefz, and to the soliciting of contributions carried on so successfully by Mrs. Eugenie Kirchhoff, Mrs. John Otto and other ladies, the new Home for Women could be opened on October 2, 1892. The officers of the Pioneer Frauen Verein at that time were; President, Mrs. F. C. Adler; vice-president Mrs. A. Autenrieth; secretary, Mrs. Elise Weller; financial secretary, Mrs. Anna Maria Schlenker; treasurer, Mrs. Geiger.